Only 25 minutes from Chico, the Forebay Aquatic Center is a great place to try out kayaking and see if it's for you. They have rentals that run from May 26 through Labor Day (coming up quick!). They are in operation Th-F 2p-7p and Sa-Su 10a-7p. OPEN Labor Day 10a-7p. Thursdays and Saturdays if you rent one kayak, you get your 2nd for 1/2 price. The simple man-made forebay is easy to navigate with basically no current so it's a perfect place to learn. Just an hour from Chico you'll find Black Butte Lake. A great destination for kayaking, fishing and camping. When the lake is full, there are some 40 miles of shoreline to explore. The lake is pretty exposed so it can get windy at times. It's a good spot for both beginning and intermediate kayakers. This beautiful mountain lake sits at about 4500 ft. elevation and is just under 2 hrs. from Chico. Just before you get to the lake, you will go through the small city of Chester. There are some great local spots to grab some food and supplies before you hit the lake. From Lake Almanor you will have a beautiful view of Mount Lassen in the distance. This is a popular water skiing destination so you might want to stick to the shoreline and explore some of the coves. The morning and evening are the best times to get out on the lake. 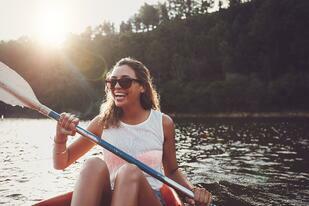 17 miles of shoreline, tall pine trees and sandy beaches make Bucks Lake a picturesque kyaking destination. There are lot's of fishing and camping opportunities as well. It's only a 2 hour drive from Chico and you'll find it much quieter than more popular sites like Lake Oroville. Just below the Oroville Dam and only 30 - 40 minutes from Chico, there is a lot of slow moving flat water on the lower Feather River. It's a great spot to learn or for a long and lazy drift down the river. The upper Sacramento River from Redding to Red Bluff is a mix of winding turns and small riffles. You can put in near the Sundial Bridge, only about 1.5 hrs. from Chico. In the springtime the flow is more intense than the low flow of late summer. Experienced paddlers can make a multiple day trip out of this run. Less experienced paddlers can still find very mellow stretches to enjoy. According to Whitewater Guidebook "The Middle Fork of the Feather River is one of the most beautiful and difficult rivers in California. It should only be attempted by teams of expert rafters and kayakers with experience in remote wilderness. It's usually done as a 3-4 day trip so there's plenty of time to scout and portage rapids." If that description doesn't scare you, this might be the spot for you. 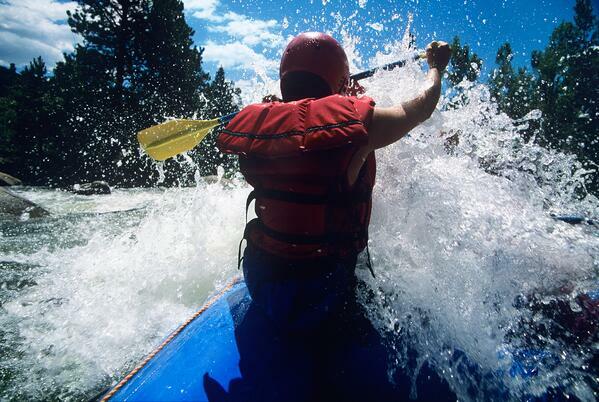 The rugged beauty of the terrain and the challenging rapids will make for an experience to remember. It will take a couple hours to get up to the launch area and you will want to leave another vehicle below, where you plan to end. There is some pretty treacherous water through this area, so try to go with some one who already knows the area. For more ideas about things to do in the summer around Chico and other surrounding areas, check out our North State Living page!